The Walking with Our Sisters memorial art exhibit made a stop in Yellowknife this month, for approximately 2 weeks. It’s a commemoration of the lives of the Indigenous women (and girls) who have gone missing or been murdered. It’s a momentous and rather sobering topic for an exhibit – missing and murdered women and girls – and it was about a lot more than that too. At the entrance to the exhibit was a sign, requesting that visitors remove their shoes and not take photos. From the very start, everything was geared towards showing respect for the lives being remembered. I was granted permission to use a couple of photos from the Facebook page. Next, one of the many volunteers performed a smudging with sage and sweet-grass, to cleanse my energy before I entered. Then another offered me some loose tobacco to hold in my palm as I walked through the memorial. The intention was that I would imbue it with good energy and prayers, and that I should place it in a cedar box when I left. At the end of the day, the energy and prayers of all visitors would be offered up by burning the tobacco in the sacred fire outside. The exhibit consisted of moccasin vamps (or uppers) decorated with beading and embroidery, by approximately 1,200 artists. The vast majority of them were made and contributed by artists in Canada, but there was also a significant quantity from the US, and a few from distant places, such as Australia, Scotland, Germany and Bulgaria. As I entered, I was struck by the sheer number of them. They were laid out neatly in pairs along a path that wound through the two display rooms, where the floor was covered in a brilliant red fabric, kept spotless by volunteers constantly using lint brushes and other cleaning tools. There were 1,763+ pairs of them, each representing a woman or girl, a human being who someone had seen alive for the last time, and who had either vanished without a trace or had turned up dead. By extension, each one also represented a family grieving for a lost member, whose destiny some would never know. They were the wife, mother, grandmother, daughter, sister, aunty, or cousin who had been lost to them, but never forgotten. The enormity of it was staggering. The use of the vamps alone, not the complete moccasin, was meant to symbolize unfinished lives, lives that had been cut short, personal stories with endings unknown. The designs on the vamps were of a wide variety: mother and child images, girls, women, patterns and symbols, animals, bear paws, eagle feathers, decorated photos of some of the women and girls. Some of them contained the embroidered names of the victims and clearly reflected the artist’s feelings of love and loss. Background music was softly playing and the atmosphere throughout was one of reverence, respect…and great loss. It was both moving and somewhat overwhelming. It felt like a temple, a sacred space. The space was decorated with cedar boughs, animal furs, replicas of dried fish and other symbols of the traditional lifestyle. It was interspersed with seats and boxes of tissue if it got to be too much for you, and counsellors were also on hand for those who might need one. If you live in Canada, you would know that there have been calls for a national public inquiry into the missing and murdered Indigenous women and girls. If you live in Canada, you would also know that nothing is being done about it. According to the RCMP’s National Operational Review of Missing and Murdered Aboriginal Women, between 1980 and 2012, there were 1,017 homicides of Aboriginal women and girls reported by the police across the nation. This represents 16% of all female homicide victims. As of November 2013, there were another 164 of them who were considered to be missing, accounting for 11.3% of the total number of missing females in Canada. These statistics are disturbing enough, more so when you consider that Aboriginal females represent only 4% of the female population in all of Canada. The premiers have supported the call for a national public inquiry, but it has fallen on deaf ears at the federal level. This is where I think this memorial extends beyond itself, into the larger issue, that of the treatment of Aboriginal people in Canada. 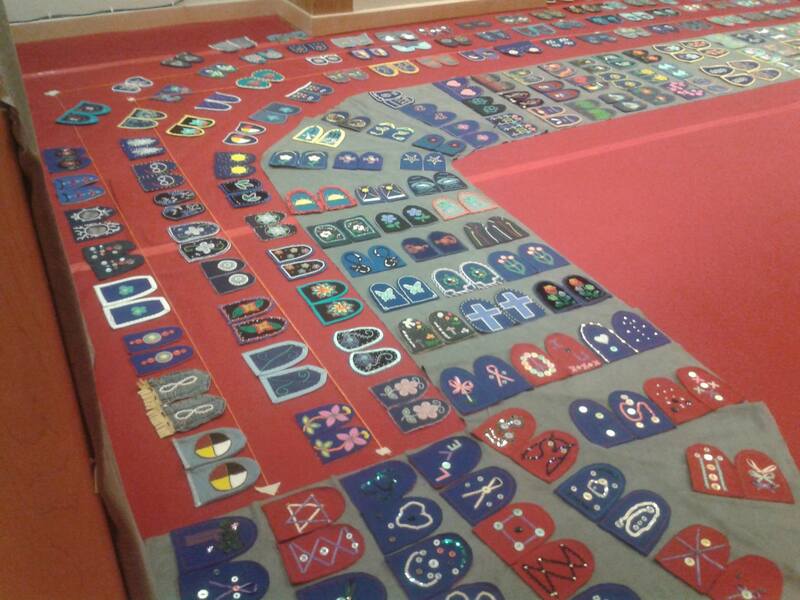 In addition to the 1763+ vamps memorializing the women and girls, there was a section near the stage with 108 small vamps for small feet, representing children who had never made it back home from Residential School. Centre stage along the path, with children’s vamps lining the stage. When I learned about Residential Schools, or “Indian Residential Schools” as they were officially named, and other state-sponsored inhumane treatment of Aboriginal people, I came to realize that there are two Canadas. There is the shiny image of the “fair, just and civilized society” that is put forth to the rest of the world, which seems credible given the high rankings in various studies and UN indices. Then there is the other version, the one that is locked in a cage in the corner and hidden behind a curtain. It is a state that created laws and sanctioned the most brutal treatment of Aboriginal people – which has ripple effects to today – and now treats them with either indifference or contempt. There are many good things about Canada, but it is also a land of myth and illusion. I think that with many contemporary social issues, better understanding is gained from knowledge of their historical roots. We all live in this society, we are all connected by our common humanity, and facts are facts. They don’t change or disappear because we decide to not talk about them. It’s important to note that there are many people who attended Residential School, who were decently-treated, who will tell you that “it wasn’t so bad” and it was not a major event in their lives. But for thousands of others, it was such a traumatically scarring experience that it required its own Truth and Reconciliation Commission. The aim of those schools was the assimilation of the native population into the mostly white society and the inculcation of “Christian values”. A phrase that was commonly used was “killing the Indian in the child”. What that meant was that Aboriginal parents lost control over how their children were raised, because they were not allowed to be present during most of their formative years. A lot of the schools were funded by the federal government and run by the “Christian churches” mostly Catholic and Anglican. They started operating in the late 1870s, there were 139+ of them and the last federally funded one closed as recently as 1996. There were also schools funded by the provinces and by the church, the number of which isn’t known for sure. Children were forcibly removed from their families at a young age and sent to these schools. In remote communities the nearest school might have been a plane ride away. They were away from their families for the entire school year, and sometimes for years. They were not allowed to speak their mother tongue, not even to their siblings, nor to adhere to any of their cultural practices. They were punished if caught doing so, and the Christian nuns and monks who ran these schools could be a sadistic bunch. Children endured vicious beatings for the slightest thing, humiliation in front of their peers, psychological and sexual abuse and in some schools, even forced sterilization. They were not properly fed, nor given proper medical attention when they fell ill. I have heard some of the survivor testimony from the Truth and Reconciliation Commission and it is exceptionally hard to take. There were tales of beatings, stealing food because they were hungry and being beaten when caught with it, and even of little bodies being jolted in an electric chair while the nuns looked on and laughed. Naturally, some children ran away. If they did so during the harsh winter, some of them perished in the cold. 150,000 Aboriginal children passed through these schools and according to the Truth and Reconciliation Commision, approximately 4,000 of them died in school, from various causes, including disease. Schools didn’t always notify parents that their children had died. Many only learned this when they were informed by other students returning home, but they didn’t always know what had happened to them or exactly when they had died. Since the Canadian government didn’t want to spend the money to ship the bodies back home, the children were buried in unmarked graves on school property, so parents could not even do a graveside visitation. To add insult to injury, the Sixties Scoop was piled on. From the 1960s until the mid-1980s, new-born Aboriginal babies were taken from their mothers and adopted into mostly white families. Some were adopted in the U.S. It was another form of state-sanctioned cultural genocide, affecting an estimated 20,000 people. Within the past 5 years, 2 lawsuits have been filed over it, in Ontario and British Columbia. The family is the basic unit of human society, and these 2 practices systematically and systemically destroyed countless Aboriginal families. The result was parents who could not pass on their family or cultural traditions, or their language; children with no sense of cultural identity, whose own parents and siblings were like strangers; generations of abused children who hadn’t been parented and so didn’t know how to parent, and adoptees who didn’t know where they came from or who their blood relatives were. Until 1960, Aboriginal adults were not allowed to vote federally or to sit on juries unless they gave up their “Indian Status”, which grants them certain rights, such as to hunt out of season, to live on reserves and income tax exemption. In this day and age, there is still something called the “The Indian Register”, maintained by Aboriginal And Northern Affairs Canada. It contains the names of all Aboriginal people registered with the federal government under The Indian Act, i.e. Status Indians. Data includes births, deaths, marriages and divorces. It harkens back to another era of inhumane treatment and the systemic and systematic destruction of the family – when slave-masters used to keep records of the births, deaths, marriages, purchases and sales of their slaves. A previous version of the Indian Act (from the 1870s) made Aboriginal people wards of the state and installed Indian Agents. Grown men and women had to obtain the permission of their district Indian Agent to do various things. From the 1880s to the 1930s there was a pass system in Western Canada, much like that which prevailed during the apartheid era in South Africa. Aboriginal people could not leave their reserves without a pass. Sadly ironic, given that so much is played up of Canada’s alleged role in ending apartheid. All of these things are like the horrible family secret that nobody talks about, that only some relatives know, choosing to focus on keeping up the shine and hoping that if the secret isn’t revealed to the younger generations, it will be forgotten and fade away. The strategy works, because I have friends who were born and raised in Canada and didn’t know that Residential Schools existed, nor that they were still in operation during their lifetimes, and had no clue about the Sixties Scoop. It’s worth noting that I didn’t learn any of this from the booklet that I was given to study for my citizenship test. That contained only the shiny stuff, in the best patronizing tone that taxpayers’ money could buy. So if you don’t put it in the school curriculum and you don’t tell the immigrants about it, it’s no wonder that the common attitude seems to be “What are those Aboriginal people fussing about now?” A recent MacLeans cover story on the racism and bias that Aboriginal people face on a daily basis illustrates this attitude quite clearly. But when we choose to look behind the curtain, to uncover the family secret, we can no longer be ignorant, brainwashed or uncaring. We can be open to having the discussion that’s necessary for anything to change, in the society that we all inhabit. 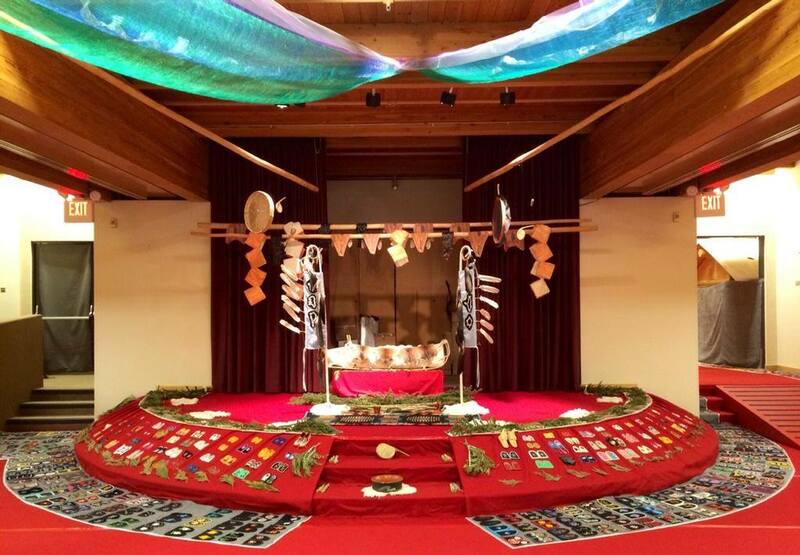 We can look at a memorial like Walking With Our Sisters in the year 2015 – and the request for an inquiry into the disproportionately high numbers of missing and murdered Aboriginal women – in a more informed light. We can understand that it is like reopening the wound to have this request considered as not important, to have it ignored, especially when money is spent on less important, shiny things. We can understand that it conveys the message that neither these women nor their grieving families are important, are worthy – a message that has been sent for 140 years. Today, the shiny illusion prevails and the same descriptions from 140 years ago are still being used. There is much talk about the “uncivilized”, the “savage” and the “barbarians” who will surely storm our shiny gates unless we bomb them to smithereens abroad and lock them up at home on mere suspicion. It’s also considered absolutely essential to draw up legislation precisely titled “The Zero Tolerance for Barbaric Cultural Practices Act” to keep potential barbarians from immigrating to our rather civilized gates. Always implied is that we are the righteous, civilized ones. Some people will always prefer to focus on the shiny image and won’t have the courage to deal with the family secret. The Walking With Our Sisters commemorative exhibit will be touring various cities in Canada and the US, through to 2019. You can find the schedule here. I highly recommend that you go and experience it. Sobering ? Nothing will lead me to alcohol faster than reading about human strife…. but on the topic of aboriginal assimilation into modern culture, I suggest it is simply impossible to achieve without collateral damage… there will be missteps but also successes…. success stemming from progressive thinking, action, and circumstance….. the repetition of ‘bad stuff’ happening is not necessarily synonymous with ‘nothing been done’ but more in line with ‘not getting it right’, a lack of oversight, and/or funding…. then there’s the subtle idea of abuse of women — it’s amazing why people call for more education before they fight for stricter laws, more jail time etc…. I think the concept of assimilation can be dangerous, as history has proven. We can make no progress without affording people even the most basic respect. There’s nothing subtle at all about even the idea of abuse of women. Stricter laws and jail time don’t solve that problem…although the current administration is a big fan of more jails, more jail time and punishment in general, despite a decreasing crime rate. By the time they’re done, there might be more people in jail than out.